Lucknow, March 19: Priyanka Gandhi Vadra on Tuesday held a roadshow in Chunar, Mirzapur. The Congress General Secretary for Uttar Pradesh East, also visited Vindhyavasini Devi and took darshan of the goddess earlier in the day. This is the second day of Priyanka's campaigning as part of the "Ganga Yatra" undertaken by the AICC General Secretary. On Monday, March 18, Gandhi began the Congress election campaign for 2019 Lok Sabha polls from the holy city of Prayagraj. 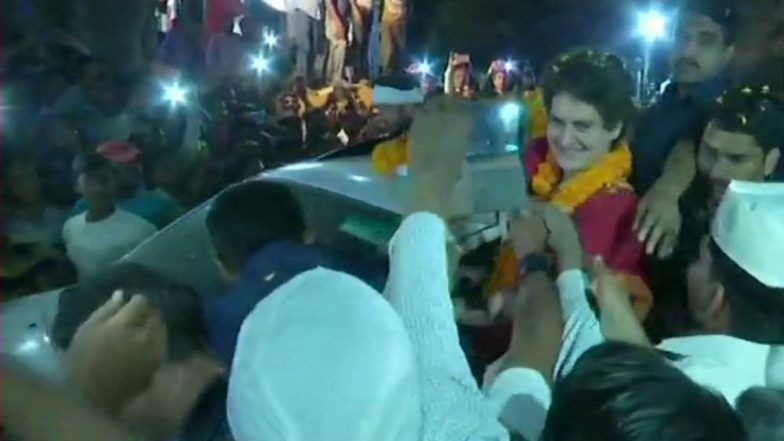 Priyanka Gandhi Kickstarts Uttar Pradesh Campaign With Attack on PM Narendra Modi, Says 'Chowkidars Are For Rich, Not Farmers'. Priyanka Gandhi Vadra on Monday boarded a boat to start her three-day long Ganga Yatra from the Manaiya ghat in Prayagraj. "Ganga maiyaa will give us blessings. She is very generous,” Priyanka said while talking to reporters. Priyanka Gandhi Vadra Makes Debut on Instagram Ahead of Lok Sabha Elections 2019. Commenting on Yogi Adityanath's rule in the state of Uttar Pradesh on Tuesday, Priyanka said that the ground reality was different than what the Uttar Pradesh government has been portraying and there is an expiry date to the rant that nothing was done in the past 70 years.